Compaq - 169486-001 COMPAQ PROLIANT 6500 SYSTEM BOARD P/N: 169486-001. Compaq - 359251-001 HP/COMPAQ - SYSTEM BOARD WITH PROCESSOR CAGE FOR PROLIANT DL380 G4(359251-001). IN STOCK. SHIP SAME DAY. Compaq - 436645-001 HP/COMPAQ - QUAD CORE SYSTEM BOARD FOR PROLIANT BL460C(436645-001). IN STOCK. SHIP SAME DAY. Compaq - 438249-001 HP/COMPAQ - DUAL CPU SYSTEM BOARD FOR PROLIANT BL460C (438249-001). IN STOCK. SHIP SAME DAY. Compaq - 409741-001 HP/COMPAQ - SYSTEM BOARD FOR PROLIANT DL360 G4(409741-001). IN STOCK. SHIP SAME DAY. Compaq - 412324-001 HP/COMPAQ - SYSTEM BOARD FOR PROLIANT DL580 G3(412324-001). IN STOCK. SHIP SAME DAY. Compaq - 290559-001 HP/COMPAQ - SYSTEM I/O BOARD WITH PROCESSOR CAGE FOR PROLIANT SERVER (290559-001). IN STOCK. SHIP SAME DAY. 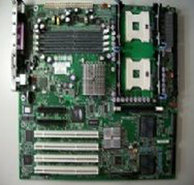 Compaq - 382133-001 HP/COMPAQ - SYSTEM BOARD FOR PROLIANT DL360 G4(382133-001).IN STOCK. SHIP SAME DAY. Hewlett Packard - 383699-001 HP/COMPAQ - SCSI I/O BOARD FOR PROLIANT DL360 G4(383699-001).IN STOCK. SHIP SAME DAY. Compaq - 435949-001 HP/COMPAQ - SYSTEM BOARD FOR PROLIANT DL360 G5 (435949-001). NEW BULK. IN STOCK. SHIP SAME DAY.